We’ve had the Lego cufflinks. so how about matching them up with this Paul Frank Lego buckle belt. 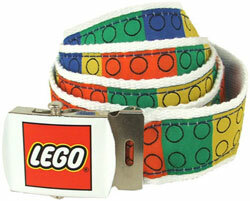 It’s a casual cloth belt, with colourful Lego brick design throughout and a metallic Lego logo buckle. Just one size – 45 inches x 1.25 inches – but you can adjust it right down if you’re a little slimmer than that. Available online now, you can pick one up for $20 (around £11). Hi, just came across this site and it’s amazing! Love anything retro! Can’t wait to browse around some more to check out other finds. Keep up the genius work!